Are You SURE That Title is Clear? Everyone who has ever bought a house will enjoy this that came to me in an email recently. Whether it's absolutely true or not, we can all relate to the unique challenges that bureaucracies present us with. "Your letter regarding title in Case No. 189156 has been received. I note that you wish to have title extended further than the 194 years covered by the present application. I was unaware that any educated person in this country, particularly those working in the property area, would not know that Louisiana was purchased, by the U.S., from France in 1803, the year of origin identified in our application. The good queen Isabella, being a pious woman and almost as careful about titles as the FHA, took the precaution of securing the blessing of the Pope before she sold her jewels to finance Columbus' expedition. Now the Pope, as I'm sure you may know, is the emissary of Jesus Christ, the Son of God, and God, it is commonly accepted, created this world. 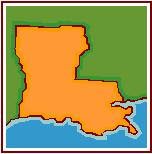 Therefore, I believe it is safe to presume that God also made that part of the world called Louisiana. God, therefore, would be the owner of origin and His origins date back to before the beginning of time, the world as we know it AND the FHA. Internet Only Advertising? Not For Me! 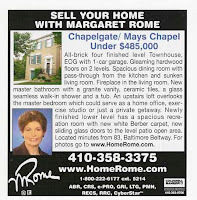 An article I read recently seemed to take the position that anyone who spends money on print advertising is wasting money, and that those old-fashioned ads that stain your fingers may make the sellers feel good but they don't sell houses. Call me old-fashioned then, but I do both print and Internet advertising. I know that not everyone who buys a house – or who is helping someone look for a house – is in their 30's. There is another generation and they do read newspapers, and they do need print ads. This generation includes people with lots of disposable income who are looking for nice hom es. It also includes people with children and grandchildren who may need a new home, and these parents have time to help their kids with the search. Why would you ignore an entire group of potential clients by refusing to talk to them in the way that will reach them? Sure, many of them are tech savvy, but they often find us on the web after seeing our names and faces in newspapers, in glossy magazines, or hearing us on the radio. It's true that many potential buyers start a home search on the internet before they ever contact a Realtor®. But that doesn't mean that just having a Web presence is enough, any more than doing the Three P's is enough. 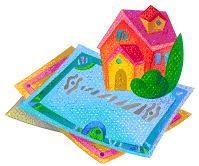 Placing the listing in the MLS (which is NOT the same as advertising on the Web, though some agents think so), Placing a si gn in the ground, and Praying – these won't sell houses. Knowing the market, taking the time to listen and learn about the client's needs, working my wide network of connections and resources, investing my time and talent in each transaction, and yes, placing ads in all appropriate media, that sells houses. Sure, you can Google me and my properties anytime. I'm there. But I'm also in the Merchandiser, the Baltimore Jewish Times, and the New York Times when the property needs that. Some sellers like to see their home in the paper, others love to see it on their computer. Whether it's a big ad on your web site or a print ad in the local paper, how can it be wrong to do whatever it takes to reassure your seller while you market their home? The full-service commission that I receive does pay for the print ads, for the Internet ads, and for the many hours of my time. It is recognition that I apply all my knowledge, skill and experience to getting the best price for the home and making sure the seller is happy. This advertising also keeps my name and face in front of the public and keeps a future waiting list of sellers. So forget print advertising? Not at this time!